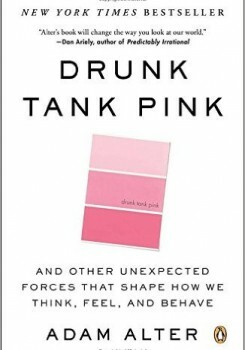 This excerpt from “Drunk Tank Pink” explores whether names affect major life outcomes. The following is an excerpt from Drunk Tank Pink: And Other Unexpected Forces That Shape How We Think, Feel, and Behave, by Adam Alter. When Carl Jung, one of the most famous psychiatrists of the 20th century, once wondered why he was so fixated on the concept of rebirth, the answer arrived in a flash of insight: his name meant “young,” and from birth he had been preoccupied by the concepts of youth, aging, and rebirth. Other renowned psychiatrists of the early 20th century embarked on very different research programs, but, as Jung explained, “Herr Freud (whose name means Joy in German) champions the pleasure principle, Herr Adler (Eagle) the will to power, Herr Jung (Young) the idea of rebirth.” As far as Jung was concerned, the names we’re given at birth blaze a trail that our destinies tread for years to come. Many years later, in 1994, a contributor to the Feedback column in the New Scientist magazine labeled the phenomenon nominative determinism, literally meaning “name-driven outcome.” The writer noted that two urology experts, Doctors A. J. Splatt and D. Weedon, had written a paper on the problem of painful urination in the British Journal of Urology. Similar so-called aptonyms abound. The current Lord Chief Justice of England and Wales is Justice Igor Judge; his colleague, Lord Justice Laws, is a judge in the Court of Appeals. In the realm of athletic pursuits, Anna Smashnova is a professional Israeli tennis player, Layne Beachley is a seven-time world champion surfer, Derek Kickett was an Australian Rules footballer, Stephen Rowbotham was an Olympic rower for Britain, and Usain Bolt is the fastest man in the world over the 100 meter and 200 meter distances. Some names come before less auspicious destinies: Christopher Coke is a notorious Jamaican drug dealer and the rapper Black Rob was sentenced to seven years in prison for grand larceny. Meanwhile, Jaime Sin overcame his inauspicious name to become Cardinal Sin, Archbishop of Manila. It’s tempting to dismiss these anecdotes as scattered coincidences, but researchers have shown that our names take root deep within our mental worlds, drawing us magnetically towards the concepts they embody. Indeed, names convey so much information that it’s easy to forget that they don’t have natural meanings like, say, numbers do. The number 10 will always have the same meaning regardless of whether you call it ten, diez, dix, or dieci, which is why scientists seeking extraterrestrial contact devise mathematical languages to communicate with alien life forms. A single pulse of noise will always signal one, or unity, whereas two pulses will always signal two. That universal property doesn’t apply to names, which are language-bound. Jung’s witty observation that Freud’s name compelled him to “champion the pleasure principle” only registers if you know that Freud means “joy” in German. Names are only powerful, then, when they’re associated with other more meaningful concepts. Parents from certain cultures embrace this idea when naming their children. The Nigerian president, Goodluck Jonathan, grew into his name handsomely, and his wife Patience Jonathan was named for a trait that first wives sorely need as their husbands ascend the political ladder. According to one Nigerian proverb, “when a person is given a name, his gods accept it,” which explains why exhausted parents sometimes name their children Dumaka (literally, “help me with her hands”) or Obiageli (“one who has come to eat”). The Mossi tribespeople of Burkina Faso have taken nominative determinism one step further, christening their children with strikingly morbid names in a desperate bid to placate fate. Parents who have already lost more than one child (the Mossi infant mortality rate is tragically high) have been known to name their subsequent children Kida (“he is going to die”), Kunedi (“dead thing”) or Jinaku (“born to die”). Other parents do everything they can to protect their children from the tide of nominative determinism. In his native Russian tongue, Vyacheslav Voronin’s name means “slave.” As far as associations go, that’s a significant cross to bear, so Voronin and his wife, Marina Frolova, decided to save their newborn son a similar indignity. Slight and sandy-haired, the boy was born in the summer of 2002 during a spate of terrible Russian floods. True to their promise, Vyacheslav and Marina chose a generic name designed to be devoid of meaning: BOHdVF260602. Although the name seems meaningless, BOHdVF260602 is an acronym that stands for “Biological Object Human descendent of the Voronins and Frolovs, born on June 26 2002.” For the sake of practicality, young BOHdVF260602 responds to the name “Boch” (roughly pronounced Bortch). Vyacheslav claims that Boch’s name “will make his life easier, so he won’t interact with those idiots who think one’s name defines his appearance. Every person who gets a traditional name is automatically linked to his historic background. This way, my son will be devoid of his father’s legacy.” People name their children using all sorts of rules and approaches. Sometimes they borrow names from historic or literary heroes, sometimes they perpetuate ancestral naming traditions, and sometimes they just like how a name sounds or the fact that it reminds them of something appealing. In all cases, though, the otherwise meaningless name acquires meaning because it’s associated with other concepts that are themselves meaningful. The power of association explains why Adolf, a common boy’s name once associated with Swedish and Luxembourger kings, plummeted in popularity during and after World War II. Meanwhile, the name Donald fell from favor when Donald Duck appeared in the 1930s, and parents stopped naming their sons Ebenezer in the 1840s when Charles Dickens’ newly published book, A Christmas Carol, featured the miserly Ebenezer Scrooge. What makes Boch’s name so unusual is that his parents went to great lengths to avoid choosing a name with even minimal associations. Though Vyacheslav was determined to spare Boch the teasing that he endured as a boy, it’s hard to imagine Boch emerging from childhood without being teased about his name at least occasionally. The odds are stacked higher still, as the Russian birth registry has refused to record Boch’s full name. According to Tatyana Baturina, a representative of the registry, “You can call your child a ‘stool’ or a ‘table.’ A child has a right to such a name. But one has to use common sense. Why should one suffer from the parents’ choice? He will go to kindergarten, and then to school, and he will be mocked, all because of his name.” It’s not immediately clear that naming a boy “Stool” demonstrates more common sense than naming the boy “BOHdVF260602,” and he’d be unlikely to escape torment with either name. Scattered anecdotes aside, do names really affect major life outcomes? Would Usain Bolt run more slowly with the name Usain Plod? Would urologists Splatt and Weedon have pursued different medical specialties with less “urological” names? These thought experiments are impossible to conduct in reality, so researchers have devised other clever techniques to answer the same question. Excerpted from Drunk Tank Pink, by Adam Alter. Reprinted by arrangement with The Penguin Press, a member of Penguin Group (USA), Inc. Copyright © Adam Alter, 2013.